This page is dedicated to one of WA's early explorers, who has been largely forgotten. Frank Hann explored WA extensively through the Kimberley,the Pilbara, the goldfields, to the vastness of the Great Victoria Desert. We spend more time at school learning about overseas explorers and forget our own who deserve more recognition. At least there is a National Park named after Frank Hann. Frank Hann explored for many years and named over 500 geographical features, far more than any other individual. He kept diaries of all his explorations. Most importantly the bearings and sightings he took from various hilltops are recorded in them. It is rather exciting to climb a hill and read the bearings from his diaries and actually still be able to observe what he saw nearly 100 years ago. Frank Hann was born 19th October 1845 and died 22nd August 1921. Mike Donaldson and Ian Elliot have compiled and edited a book of Hann's diaries appropriately named "Do Not Yield To Despair", available from Hesperian Press. It can add a new experience to a trip to read these diaries while in the same area that Hann originally traversed. It is remarkable to consider that Hann nearly perished for want of water, and today we can crack a cold tinny from the car fridge! Ian Elliot enjoying a break from leading a tour group around Lake Johnson near Norseman at Easter 2005. The camp spot was close to where Frank Hann named Maggie Hayes Hill. I met Ian Elliot some years ago while setting up 4 wheel drive trips around Norseman. 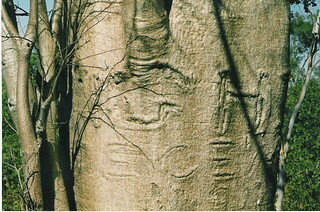 Ian has been following in Hann's footsteps for many, many years and taken numerous photos of Hann's tree markings. Around the campfire one cold night, I suggested Ian put some photos of Hann's marking on the net. This page is the result of that conversation. I wish to thank Ian Elliot for allowing me to offer these photos, and hope that people will find enjoyment in discovering one of WA's most prodigious, but forgotten explorers. The simple fact is that some of the trees may well be over 100 years old. And even trees eventually get old and die, and they can't run away from a fire. It is quite possible this is the last generation that may be able to view the actual tree. Already some of the trees in these photos no longer exist because they have been destroyed by fire or white ants. It is important that our history is recorded for the future.. Remembering our past will helps us achieve our future. The struggles of the early settlers and explorers in this country sometimes defy imagination. How many of us driving our air conditioned 4WD vehicles complete with fridge full of cold drinks ever stop to think of the days when explorers almost perished for want of a simple glass of water as they battled through the bush?